Kyocera Corporation (President: Hideo Tanimoto) today announced its 0.5mm-pitch flexible printed circuit (FPC) and flat flexible cable (FFC) electronic connectors with improved quality assurance (QA) checks — both visual and automated optical inspections (AOI) — to prevent misalignment. Kyocera's new 6892 Series connectors also feature an operating range from -40°C to +125°C and high-speed transmission making them ideal for automobile applications. The new connectors are available globally in August 2018. With the increasing use of electronics in vehicles such as Advanced Driver Assistance System (ADAS) and connected cars, the performance of automotive electronics is improving. This trend pushes the demand for connectors offering high-speed transmission capability to be used for in-vehicle infotainment, vehicle-mounted cameras, and radars, as well as reliability and optimal performance under harsh environments such as vibration and extreme temperatures. Kyocera aims to contribute to the evolution of the automotive industry by expanding its lineup with FPC/FFC connectors featuring heat resistance and high-speed transmission capability to meet the industry's growing technology requirements. 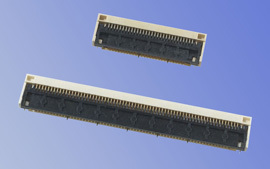 Kyocera's new 0.5mm-pitch FPC/FFC connectors correspond to the high-speed transmission interfaces of V-by-One® HS and CalDriCon®. The V-by-One®HS reaches up to 3.75Gbps maximum speed. The 6892 Series' design enables users to easily confirm quality assurance by both visual checks and AOI. 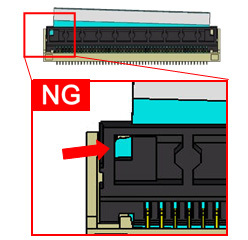 As seen below, windows on the actuator enable users to confirm insertion status and the actuator is unable to close until the FPC/FFC is in the correct position, preventing misalignment. i. The windows on both sides of the actuator allow a visual check for proper insertion. ii. 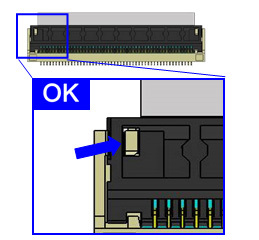 Actuator will not close until correctly inserting FPC/FFC. The 6892 Series is suitable for robotic insertion and contributes to improving the operating efficiency in the manufacturing process. The design of the new connector makes the center tip of an insulator go into windows of an actuator, which makes it difficult to break the locking section even when forcedly pulling the FPC/FFC. The new 6892 Series features a wide operating temperature range from -40°C to +125°C, making them ideal for the extreme temperatures required for automotive and industrial applications. The commodity type for consumer equipment applications with a heat resistance up to +105°C will also be available. The 6892 Series corresponds to V-by-One®HS and CalDriCon®, the high-speed interfaces. V-by-One®HS achieves 3.75Gbps maximum speed. The 6892 Series accommodates shielded FFCs with grand terminals that optimize high-frequency by impedance matching and reduce the effect of noise. Width 6.3mm D.W. voltage AC 200Vrms/min. "V-by-One" and "CalDriCon" are registered trademarks of THine Electronics, Inc.